For ither uises, see Volga (disambiguation). 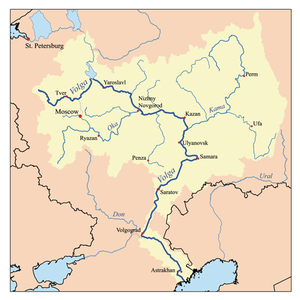 The Volga (Roushie: Во́лга) is the langest river in Europe; it is Europe's lairgest river in terms o dischairge an wattershed an aw. It flows throu central Roushie, an is widely viewed as the naitional river o Roushie. Eleiven o the twinty lairgest ceeties o Roushie, includin the caipital, Moscow, are situatit in the Volga's drainage basin. Some o the lairgest reservoirs in the warld can be foond alang the Volga. The river haes a seembolic meanin in Roushie cultur an is aften referred tae as Volga-Matushka (Mither Volga) in Roushie leeteratur an fowklear. Wikimedia Commons haes media relatit tae Volga.